The show is about Washington politics, and it's based on the premise that nothing is as powerful as the lust for power. That lust is the main motivation for House majority whip-turned vice president, Frank Underwood – brilliantly portrayed by Kevin Spacey. Frank isn't an anti-hero; he is a shrewd villain. Together with his wife, Claire, Frank connives his way up the Washington ladder, and he does it under the assumption that “ruthless pragmatism always wins”. 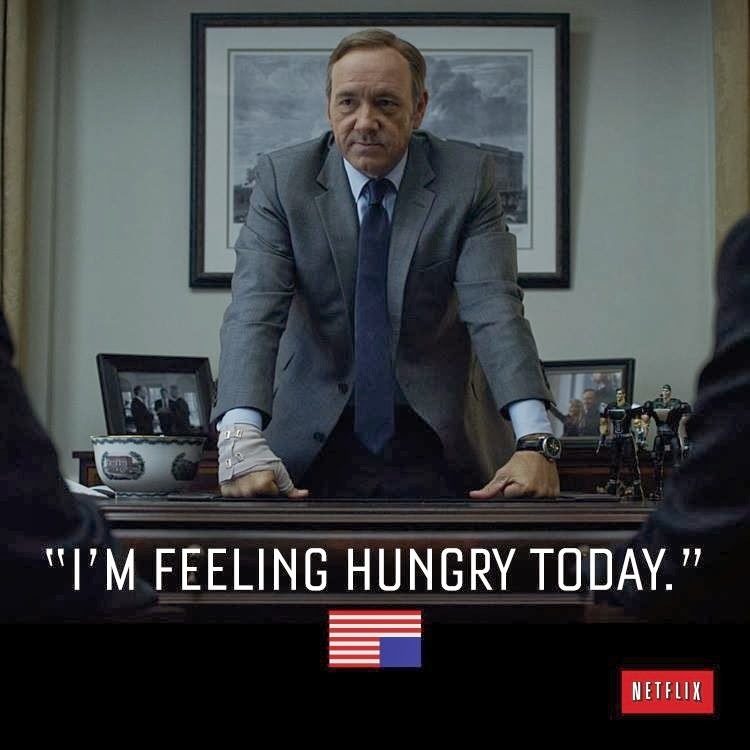 House of Cards has engaged me powerfully – it makes my heart groan. The show is filled with malevolence, duplicity, and cunning. It is exciting and depressing at the same time, with delicious subplots that lead to creepy-cool scenes. The exquisite writing and superb acting illustrate the range of human emotions and desires in a profound and eloquent way. The chilling backstabbing behaviours and manipulations of the Underwood’s make them despicable people. Yet, I cannot help but to root for them at times. That is the genius of the show. I identify strongly with many of the characters – particularly, Frank Underwood. He is unfit to love because he is ill-disposed toward vulnerability. He is driven (read ruthless), cynical, and entitled. Francis is an influence-peddler; someone who only serves his self-interest, and is always hungry for more. As he climbs to the top of the ladder, he begins to comprehend that power alone cannot fully satisfy him. In many ways, I noticed that I am Frank Underwood. This realization forced me to ask myself, what and whom do I serve? As a Jesuit, I know I am called to serve God and his people, but is that my only drive and motivation? What is my main inspiration when I work, when I talk to others? Observing Frank’s base needs and instincts makes me ponder whether I live as if everything is a gift, or instead obsess with protecting the little that I have? Am I self-centred, or others-centred? If I am honest, I am often driven by my ego. Many of the things I do are done for the greater glory of Santi. Many a time, I act to seek affirmation and appreciation. I might not lust for power in the way Frank does, but I worry and obsess with things I cannot control. I know life is to be lived and not controlled. Yet, I deal with small defeats in the same way Frank deals with setbacks. I understand many of the emotions and desires portrayed in the show. They can be so paralysing and upsetting. At times I struggle to live authentically. The biggest difference between Frank and me is that I have learned to seek and to find God in all things, and to make space for him in my life. I try to surrender all that paralyses and leads me to self-centredness. As I watch the show, I try to notice what occurs without judging the characters. I listen to what they say, and witness what they do, hoping to discern their real motivations – the desires of their hearts. In that process, I also pay attention to my intentions and motivations. At times, it is hard not to judge and I long to become the grand magistrate who delivers justice. Disgust wells up in me, and I loathe Frank and his puppets. Thankfully, it only takes a few minutes of self-righteousness to realize that what I detest in Frank is what I detest in me: concupiscence, pride, dishonesty, and lust. Frank Underwood is the conniving, power-driven man I hope I never meet. He is also the least desirable aspects of my personality that I struggle with every day. My contemplation of this show invites me to make space for God – to ask him to set me free from my self-righteousness and narcissistic tendencies. TV-watching can be emotionally intense and very good for the soul. Good television invites us to feel, to ponder, and to be absorbed into the heart of the matter. If we accept the invitation, we might be lucky enough to discover what really matters to our hearts. A fantastic post. Taking TV watching to a much higher level. Thank you very much for this. Thank you, Claire. I am thankful that you share our posts on Twitter. I am always trying to improve my writing. I welcome all suggestions. You are in my prayers. Thank you, sister. I strongly believe that good books, films, and tv shows can transform our lives. I am inspired by your work on evangelization - very grateful for the Daughters of St Paul. Blessings. Santi, you are not Frank Underwood. But I get your point. I really liked your reflection on ego, and Frank's inability to love. I agree that good television can help us ponder.